WE are truly spoilt living in Andalucia, where we can pretty much eat outside all year round. Apart from the odd rainy week in winter, we are never short of sunny days to head down to our favourite restaurants for a lazy two hour meal on their terrazas. Living in Andalucia for the last decade I have made it my business to find all the best restaurants around the region’s eight provinces. And I have certainly been spoilt for choice. In Ronda, the best of the bunch, must be Almocobar, sitting in an ancient square by the historic Almocobar arch, while nearby Arriate has its charming El Muelle, next to the train station, perfect for watching the sun set. Two other fabulous picks nearby are Al Lago in Zahara de la Sierra and Molino del Santo in Benaojan. Both have spectacularly good terraces for dining, the Molino by a raging stream with plenty of trees for shade, Al Lago with some of the best views in Christendom (and once, of course, under the Arabic Kingdom of Granada). Down on the coast we have got to know some of the best places to eat out. The Beach House in Elviria takes some beating, sitting on a quiet stretch of sands, while Polo House, in Marbella, and La Sala, in Puerto Banus are THE places to watch the coast in action. In Malaga city, Restaurante Vino Mio, right by the Cervantes theatre, has a great terrace to while a way a hot summer’s evening, while in Nerja, Carabeo has an amazing garden terrace overlooking the sea. Other personal favourites include Patria and La Castilleria in Vejer de la Frontera and wonderful Tesoro near Tarifa and Cancha II in Sotogrande. You are also spoilt for choice in Casares, where the Forge, Venta Garcia and Arroyo Honda all have amazing terraces to dine on. Now well-established in Sotogrande, the Hairy Lemon is one of the area’s best hangouts. Serving fresh food all day, there is a good list of wines and over two dozen tapas created by chef Lorenc, who spent 14 years working in the restaurant trade in London. Right in the heart of Sotogrande port, with a perfect view of the boats, is the lovely restaurant run by Belgians Jessy and Anne Hoornaert. The hard-working pair have many years experience between them and first started their reign in Spain just up the coast in Duquesa at a beach-side joint called Babelu. It built up a good reputation over a number of years, before the pair headed off to the Dominican Republic with their children for four years. Well, they have now returned and are doing a great job in Sotogrande providing a great mix of Spanish, French and international dishes with a bit of flair that they picked up in the Caribbean. It is one of the few restaurants where you can literally arrive by boat. 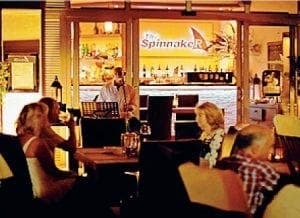 And these days The Spinnaker, owned by friendly couple Monica and Janus (John) from Budapest, also has a great cocktail bar to go with it. An enterprising pair, the menu is very international with a great range of wines, but, best of all, as from this week, they have a fabulous new cocktail bar right by the water which is really making waves. Why not head up to explore in Casares, just 10 minutes inland from the coast, where you will find the authentic family-run restaurant Casa Curro. Best of all, sit on the terrace and enjoy one of Andalucia’s best views across one of the most authentic Andalucian towns.